From PAX East over the weekend, we were given many updates as to the future of Magic. First and foremost, we have two new cards to check out. We have Ruric Thar, the Unbowed as well as Maze's End. We'll get to Ruric Thar later. The important thing is to get Maze's End, you either need to get it at the prerelease, or pull it in the land slot from a booster pack. Of course, the Maze's End card here is only the foil alternate art promo. The art for the actual card is below these two official card images. Well, technically it isn't new art, just "zoomed out" art. Essentially the original guildgates are only partial portions of the full guildgate art, which will now be used for the Dragon's Maze versions. It's official! The Friends set is named Theros. Romans is Born of the Gods. Countrymen is Journey into Nyx. I may have predicted Journey into Nyx wrong, but it was still a new set name. 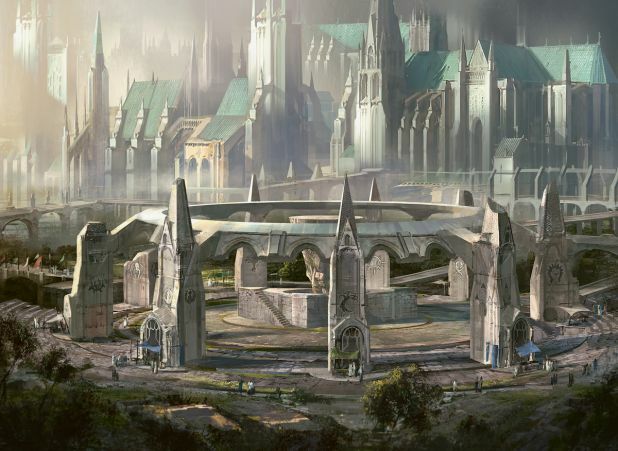 Theros was originally a place in Dragonlance in Dungeons and Dragons which is also made by Wizards of the Coast. But hey, nw we know all three names!